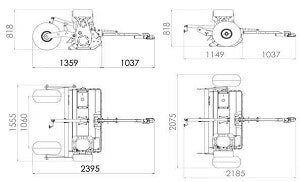 Flail mowers are available as self-powered or tractor mounted units, using a cat 1 three-point linkage system and driven by the tractors PTO system (power take off). Our ATV flail mower is self powered and ideal for being towed behind an ATV quad bike or UTV vehicle, and is favoured by smallholders, equestrian and large estate land owners when the land isn't suitable for farm tractors, due to wet, boggy ground conditions where the fields could get easily damaged. This ATV flail mower is built to tackle a multitude of tasks and is used in paddock maintenance for controlling and reducing weeds in the paddocks, cutting down docks, nettles, thistles and bracken, thus encouraging strong, healthy grass growth. 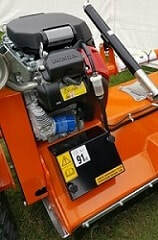 It is also the ideal mower for cutting down overgrown brambles in woodland areas and for fire break mowing, where heather and saplings need to be cut down. For this specific purpose, the ATV flail mower would need to be set up on hammer blades. The Chapman ATV flail mower range are heavy duty farm and woodland flail mowers. These ATV mowers are powered by a commercial grade Honda GXV630cc/21HP V-Twin engine, the most powerful engine available on any ATV flail mower in today's market place offering a 3-year manufacturers' warranty. 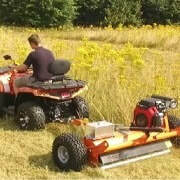 ​Our ATV flail mower models come with two cutting blade options. The most popular mower blade is the "Y" blade, suited for the majority of mowing tasks whilst the hammer blade is the right choice for much heavier duties. Our ATV flail mower has a Honda commercial grade GXV630cc 21HP V-Twin engine, featuring an oil alert warning system built in the oil pump, to ensure maximum engine protection when mowing fields or woodland on steep, sloping terrain. The most powerful engine used on any ATV flail mower supported by Honda's reputation for performance, reliability and spare parts back up when required. The FM series of ATV flail mowers are manufactured in the UK using 8 mm and 5 mm gauge heavy duty steel and built to the highest standards. The large diameter rotor arm is perfectly balanced to a G6.3 dynamic specification to ensure the smoothest cut possible. Unique double helix rotor blades system gives an unrivalled mowing result. Blade or flails options: High boron content steel or forged hammer. Adjustable rear grass deflector to suit different mowing applications. Full width anti-scalping roller protects the ATV mower blades from damage when working over rough terrain. 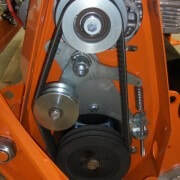 The Chapman twin belt auto-tensioning system reduces belt wear and slippage when the flail mower is used under heavy conditions. The ATV flail mower has a straight and offset drawbar feature that can be positioned left and right to cut hedges and get into the corners of the fields. The ATV flail mower is fitted with large profile 22x1x 8 tyres for low ground impact to protect the field from damage. Single cutting height adjustment lever with a range from 25 mm up to 225 mm. ​Please click below to buy 10W/30 mineral oil. ​Low oil alert warning system. Front Break Bar - Full width round bar with tapered ends fitted to the front of the ATV flail mower. This bar acts as a protection for the mower against damage from obstacles, such as bricks, boulders etc. ​The ATV flail mower's bar also helps guide the vegetation such as brambles, bracken, reeds and other materials into the machine for a more controlled cut. 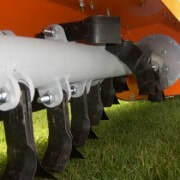 Mulching Cutter Bar - This is a serrated strip of metal that fits on the underside of the ATV flail mower and is positioned in a way that allows the cutting blades to mulch the grass to a fine finish, speeding up the decomposition process. 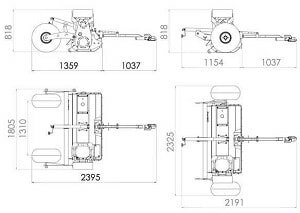 Twin Wheel Axle - When the ground is very wet and boggy the twin "walking beam" axle of this ATV flail mower is an absolute 'must'. These conditions are typically encountered when mowing reeds. Centre Mounted Engine - When the ATV flail mower is being used on steep, sloping fields and paddocks, the centre mount position of the engine balances the machine ensuring greater stability and therefore safety for the operator. Forged Hammer Flails or Blades - The upgrade to hammer flails is normally required when the mowing duties are tougher, for example woodland mowing of dense brambles, heather and saplings and other heavy vegetation. These hammer flails also give a cleaner cut when paddock topping grass. The design structure of the forged hammer blades is considerably more substantial and heavier, therefore giving a superior cut when compared to 'Y' flails. The increased weight improves the performance of the ATV flail mower when cutting through thick clumps of vegetation. Engine Power 21hp Honda GX630/V-Twin with electric start. Fuel Tank Capacity 10 Litre. Belt Size 2 x BX41 Cogged belts with automatic tensioning system. Rotor Balancing G6.3 Dynamic balanced. Deck Steel Thickness 5 mm cover, 8 mm side plates. FM150-F ATV Flail Mower with the wheels in the trailed position. We are using our ATV flail mower on a game bird shoot and using the mower on 10 acres of rearing fields. The first cut in March took down 2-feet high very thick rye grass with ease to 2 to 3 inch height and was used weekly for 5 months of the year on this job. The ATV flail mower is also used to great effect mowing down out of control thick, dense brambles and does an amazing job. 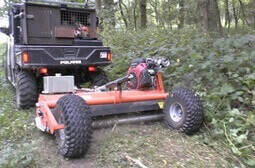 We tow the ATV flail mower behind a utility vehicle and have mowed down brambles as high as 8 feet tall in places, the UTV pushes over the vegetation and then it lifts a little before the ATV flail mower then cuts and mulches it up. We set the cutting height higher on the 1st cut to around 6 inches to 12 inches and then take a 2nd cut if needed. We have also used the ATV flail mower to cut down 6 Ft high nettles. We bought our ATV flail mower back in March this year and I have to say I`m over the moon with it. We have about forty acres of land, some of it quite hilly in places. The ATV flail mower is towed behind a 4x4 farm quad. Having such wet fields, we needed both the ATV flail mower and farm quad to be able to cope with the job at hand. The ATV flail mower has been in action typically 3 times a week this mowing season and has had to cut down heavy grass and rushes that haven`t been topped for probably, more than ten years! At it`s worse I would say the vegetation, which mainly consisted of thick grass and rushes were as high as four feet and were not problem at all for the Chapman ATV flail mower. The twin axle was a good upgrade option as the ATV flail mower copes very well with humps and hollows in the fields and rides over them with ease. Having bought a small farm on the west of Ireland, it was immediately apparent that we would need no ordinary machine to tackle the reeds on the meadows and the brambles on the hill. The meadows have not been mowed for the last 12 - 15 years, so the reeds had really taken hold, and the whole area was waterlogged. The west of Ireland has just had its wettest summer for approximately 30 years! The reeds were tall and wet with several years of dead matted reeds and grass underneath, on a very spongy peat, which no tractor could cross. The Chapman flail mower, supplied by Fresh Group Products, tackled the task with no problems, and after a second pass, took the whole meadow down to a tidy 4", with no damage to the land. With the optional twin wheels on the mower it floated over deep water gullies, and even pulled effortlessly out of trouble after slipping into a ditch. It tackled the brambles and gorse on the hill with equal ease. Height adjustment and mower offsetting to left or right is quick and straightforward. I don't know of another mower that could have coped with this challenging terrain. Local farmers are already asking me to use the machine on their land, as they haven't been able to get their tractors on it for years.